Gardeners never stop learning, and when it comes to gardening, the best education is experience. Keeping a gardening journal is a great way to build up a record of your experience, so you learn from the things that work – and don’t! Why Use a Garden Journal? A gardening journal helps you to keep track of what was sown, planted, tended and harvested during the growing season. It gives you control, so you know exactly what you’ve done and which jobs need doing over the coming days and weeks. By referring back to previous years you can refine timings and methods to reflect the unique conditions in your garden. Did the carrots you started early last spring struggle? You’ll know to sow them a little later next time. Or perhaps your tomatoes failed to ripen. Then learn from that by choosing a faster-maturing variety in future, or starting your tomatoes earlier. Use a journal to record any pests and diseases you encounter, and the strategies you used to bring them under control. Note things down, remove the guesswork, and you'll steadily improve the way you garden. Many gardeners use a simple week-to-view diary for day-by-day entries, but accurately recording everything you do can quickly get messy. And what if you also want to include visual records? Perhaps you spotted an unusual bug or maybe you’d like to photograph different lettuce varieties to compare appearance for future reference. Taking photos on the go is easy enough, but adding them to your diary isn’t exactly straightforward. Since launching our powerful Garden Planner, we've had lots of feedback from gardeners around the world asking for a better way to record what's going on in their garden. We’ve come up with what we believe is a super-convenient, intuitive journal that is a pleasure to use. The Garden Journal is a pocket-sized solution for tracking progress in the garden, quickly and easily. Access it from a smartphone, tablet, or computer. You can instantly upload photos and notes, straight from your device. Its online interface means you can record as you work, building up a Garden Journal of exceptional detail that will help you to learn with every observation, note and photo you add. And the best bit? It’s completely free to use! So let’s take a look at how it works. You can access the Garden Journal by logging in to your Garden Planner account and clicking the Garden Journal link. The Journal is divided up by weeks. When you open it up it automatically shows the current week, but you can choose to view a different week from the Timeline at the top. 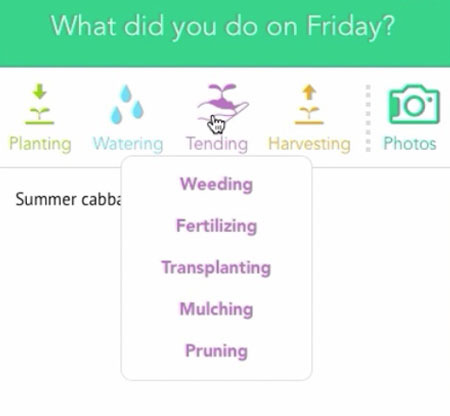 You can add your own notes, observations, and ideas, or click on any of the Planting, Watering, Tending or Harvesting options to record what you’re doing. The Tending option is further divided so you can specify whether you’ve weeded, fertilized, transplanted, mulched or pruned. Let’s say you’re planting tomatoes. After selecting the planting option, start typing ‘Tomato’ (or scroll down through the list of plants) and then select the tomato icon. You can also record the variety you’re growing by clicking on the number in the Varieties column next to the plant name. The next step is to record the quantity and whether they were planted as seeds or plants. When you’re done, you’ll see that the Planting icon for that day has been updated. As you add more records to the week, the icons and + buttons build up a visual summary of your activity. A glance at the Timeline at the top of the page provides a snapshot of your weekly activity: light green indicates Planting, blue indicates Watering, purple indicates Tending; orange indicates Harvesting; and darker green shows the weeks where you’ve made notes. Adding a photo to your Garden Journal is easy – you can drag and drop photos, or select photos from a folder. If you’re using a phone or tablet, you can take a photo there and then for immediate upload. It’s easy to change anything, at any time. Select a day or directly select an icon, view the details then change the quantity or planting method. Or, select one of the plant symbols to clear that entry and start afresh. To edit an entry from a previous week, simply select the week from the Timeline, then select ‘Edit it’ to do so in exactly the same way. Efficient gardeners plan ahead, and the Garden Journal helps you to do just that. Click on a future week to add a reminder. Make a note to yourself – you can add a related plant here too. Once you’re done, your reminder is logged for reference. You can edit or delete reminders at any time. You'll also find seasonally-relevant gardening guides here as a source of timely ideas and to help you plan. Read more, look up other growing advice, then go back to your Garden Journal. Use the Reminder feature to schedule tasks for the future so you never forget! Weeks further into the future display typical highs and lows for those dates, while the current week includes an up-to-date weather forecast so you can, for example, plan the best days to be out in the garden, or when to protect against frost. As your Garden Journal develops, you’ll be able to look back at previous weeks, months and years to see what you did when, gaining a better understanding of your gardening and learning from your own unique experiences. Or jog your memory next year by adding reminders for the following season. It’s all very powerful stuff! To start using the Garden Journal – for free! – login to your account at the top right corner of your screen, or click on Create an Account. And this is just the start - we have plenty of new features planned and would love to receive your ideas too. Let us know what you think of the Garden Journal in the comments section below. "Looks great, but I cant find a link on either my PC or my Iphone app. Where is it? " "Oops seems like it just showed up on my PC, at the Welcome screen which wasnt there before. Now just need to find it on my iphone app. " "Really excited about the journal but wish there was an android app!! Unless I'm not seeing it? IPhones aren't the only ones out there ??" "Hi Marge and Megan. The Garden Journal isn't available as an app or as a feature within an existing app - it's accessed online, via your web browser. Head to Growveg.com then either login to your existing account, or create a new account by clicking on the 'Create an account' option at the top-right of the homepage. Then, once you're signed in, just click on the Journal button to bring it up." "Any plans to include it with the Garden Planning app already in existence?" "Wouldn't it make sense to integrate the journal with the app? so that you can make notes about what you have planted alongside the entry on your plans? And with dates for each crop (when sown/planted/thinned harvested. But also searchable, please, outside the actual plan. Speaking for myself, I only use the app, as that is the most convenient when gardening." "Hi Marge and Ian. We are currently working on a new version of the Garden Planner. The Garden Journal is the first fruits of this work and will be integrated with the Garden Planner when the new version is released, which we expect to be ready by early 2020. Thanks for your feedback - and your patience - in the meantime! " "So the journal is only for a pc or mac? That's not very convenient. I take my iPhone to the garden, not my MacBook Pro. So I'm a bit confused. I take pictures of everything I do in the garden on my iPhone. I currently just keep notes in my iPhone notes under Gardening and then the Year (Fall/Summer). So this would mean I would then have to remember what I did when I got back inside, which may be after I leave the garden and house and come back 10 hours later. And so the only option is to get on my computer and start logging in everything? Please advise Thanks Debby"
"Hi Deborah. The Garden Journal will work on any Internet-connected smartphone or tablet as well as PC and Mac. Currently the Garden Planner only works on computers, but we're working on that!" "Hello Again! Don't get me wrong. I appreciate all the hard work that went into the garden journal. I just thought that when I saw the phone in use it was an app we could use on our phone. I do hope in the future there is an iPhone app we can use for the journal and log as we go in the garden. If there is, and I'm missing something, please advise. I love your videos and website. I've learned a lot. Thank you again, Debby"
"Hi Deborah, the Garden Journal works on all devices including phones and tablets. You don't install it from an App Store, instead it's accessed through your web browser so you can use it from your phone in your garden. Hope that clears up your questions." "Wow! You answer quickly!! Oh yes, I guess you're in the UK, and you're already up!! OK, so all I have to do is log in on my iPhone, yes? That's great. Sorry for the misunderstanding. I can't wait to use this. It certainly beats keeping a written journal in my phone for the watering and fertilizing. I had to scroll back months!! Thanks again, Keep up the great work. Debby :)"
"Yes, just login on GrowVeg on your iPhone by tapping on the menu button at the top of the page, then tap on Garden Journal (2nd item in the list). If you need any assistance using the Journal at any point, please contact customer support directly by tapping on Contact Us (6th item in the same list). We're available 7 days a week for help and advice." "I can't seem to find a link for the Garden Journal.... where is it?" "Hi Gary. If you scroll up to the top of the page and click on the 'Journal' tab on the menu bar, that should take you to the Garden Journal sign up page. You will need to create a new account to get started." "thanks Ben.... I was under the impression it was an app and I see nothing regarding signing up or creating a new account on that page. It just opens a seemingly "start journaling" page." "Just started my journal today, beginning with what I did a couple of days ago (watering). I selected all the various plants in my veggie garden. When I moved on the the next day and started to record watering with fish emulsion, I was not happy to see that I had to re-select all of the veggies again. Is there a way around that? I will definitely not be recording what I do each day, if it means spending the time to select over 20 different plants each time!" "Hi Gary. If you've already created a Garden Planner account, you'll be able to start using the Garden Journal without needing to create a new account." "Hi Shari. You'll be pleased to know that our talented technical team are currently working to make it easier to re-select plants you've already specified are in your garden. We appreciate your patience in the meantime!" "Excellent — thanks! Will that change (being able to re-select plants) be announced somehow? Once that’s an option, I’ll start using the journal." "Hi Shari. We'll be in touch to let you know when the update goes live. Thanks for your interest!" "Looks like a great tool and I am looking forward to trying it.. is there a way of adding other tasks completed such as turning the compost or mulching a bed?" "Hi Anthony. I'm sure you'll find the Garden Journal an indispensable tool. Many of the options have a drop-down list of activities. So for mulching, for example, you would click on the Tending option and then you'd be able to select Mulching from the list. For activities that aren't specified, which includes turning the compost, you would simply add a typed note about that activity, with or without an accompanying photo. Of course, the best way to get familiar with the Garden Journal is to create an account and have a play around with it. You can always practice, then delete what you've created to start 'properly'. Have fun!" "Is there a plan to monetize the Journal so that access would only be paid? Obviously i do not want to get all my info in an app and then not have a way to keep it if it becomes monetized and the info is not downloadable...."
"Hi Marrei. The Garden Journal will always be free to use, but there will be additional features in future that are available to Garden Planner subscribers only. More details to be announced at a later date..."
"Really excited to hear that the Journal and Planner are to be linked. " "I love the garden journal. Its fantastic. Growveg has helped me so much. I have learned everything for my allotment from you. Thank you?? Catriona"
"Hi Catriona. That's really splendid to hear. I'm so pleased you're finding the Journal useful. Thanks for the kind feedback." "Really looking forward to the Android App for the Garden Journal! " "Hi Antoinette. The Garden Journal can already be used on any smartphone or tablet. Tap on the menu button (three horizontal lines) at the top of your screen on this site, and then login to your Garden Planner account. You'll see the link to open the Garden Journal as the second option in the center of the page. The Garden Journal is web-based, so there's no need to download anything to your device. "